Sara McMann, the first American woman ever to win an Olympic medal in wrestling, will make her UFC debut on April 27, when she faces Sheila Gaff at UFC 159. The UFC officially announced the bout on Monday. It will be the third in the UFC’s women’s division as the promotion ramps up the offerings in its newest class. McMann won silver in the 63kg category at the 2004 Games. After a long and decorated international career, the 32-year-old McMann transitioned to mixed martial arts. Since debuting in May 2011, she’s gone 6-0 with three finishes. In her most recent bout, she defeated Shayna Baszler at Invicta FC 2. Due to her grappling pedigree, McMann is believed by some to offer any interesting style matchup for current divisional champion Ronda Rousey, who is herself a former Olympic medalist, though she captured her prize, a bronze, in judo. McMann’s first opponent is the German-born Gaff, 23, who is 10-4-1 in her career. She will enter the fight on a three-bout win streak, with all of those victories coming via first-round KO or TKO. In addition to McMann-Gaff, the UFC also confirmed a light-heavyweight bout between former Strikeforce fighters Ovince St. Preux and Gian Villante which will take place on the same card. St. Preux (12-5) was considered a top prospect on the Strikeforce roster after winning his first five fights in the organization. In his first major test, he lost to former champion Gegard Mousasi, though he rebounded with a third-round knockout of T.J. Cook. The fight against Villante will be his octagon debut. 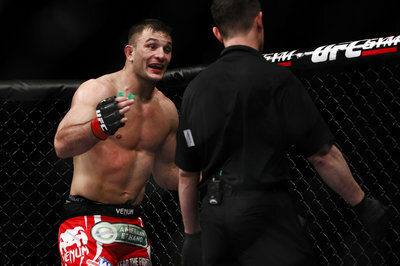 Villante will ride a three-fight win streak into the bout. He’s 10-3 overall. The event will be something of a homecoming for him, as he’s from Long Island, New York, about a one-hour drive from host location The Prudential Center in Newark, New Jersey. The event will be headlined by a light-heavyweight title match between champion Jon Jones and challenger Chael Sonnen. A light heavyweight showdown between two former Strikeforce talents has been booked for UFC 159, as Ovince St. Preux and Gian Villante will lock horns at the April 27 event. Two Strikeforce veterans will make their UFC debuts against one another in April. Ovince St. Preux will meet Gian Villante in light heavyweight action at UFC 159, Newsday reported Thursday. UFC 159, headlined by Jon Jones vs. Chael Sonnen for the UFC light heavyweight title, airs live on pay-per-view on April 27 from the Prudential Center in Newark, N.J. According to the report, the 205-pound tilt will “most likely” air on the FX prelims. St. Preux (12-5) went 6-1 inside the Strikeforce hexagon. His lone loss came against contender Gegard Mousasi in Dec. 2011. After losing his first two Strikeforce fights, Villante (10-3), a native of Long Island, N.Y., won his last three fights in a row. The fight also features a battle between two former college football players. OSP was a linebacker at the University of Tennessee, while Villante also starred as a linebacker at Hofstra University. Ovince St. Preux and Julie Kedzie left last Saturday night’s Strikeforce: Rousey vs. Kaufman with very different results. But they also walked out with the same possibility of extended time on the sidelines following injuries suffered in their respective bouts. St. Preux knocked out T.J. Cook with an overhand left in the third round of their bout, but that hand may keep him out of action, as the California state athletic commission handed him a 180-day medical suspension for a left thumb injury he sustained during the three-round fight. While the suspension sounds lengthy, it can be shortened if he receives medical clearance from a doctor. Kedzie, who lost a heartbreaker when she was forced to tapout to Miesha Tate in a back-and-forth three-rounder, also has been given a 180-day timeout, hers due to a possible left shoulder injury. Much like St. Preux, if she gains doctor’s clearance, that layoff can be significantly reduced. Those were two of the eight suspensions handed down by CSAC following the event, which took place at the Valley View Casino Center in San Diego. Sherdog.com learned via email from the California State Athletic Commission that Julie Kedzie was one of eight fighters from Saturday’s Strikeforce “Rousey vs. Kaufman” card to receive a medical suspension. Ovince St. Preux did not make good on his plan to unveil a new submission Saturday night, but the Strikeforce light heavyweight impressed nonetheless. Ovince St. Preux may have shown up to his Dec. 17 Strikeforce meeting with ex-champion Gegard Mousasi, but that doesn’t mean he showed his best. Category: Sherdog / Tags: Aug., Cook, Kaufman, Meets, Ovince, Preux, Rousey, Strikeforce, T.J.